I first wrote about Agretti back in 2015, on my old blog, so if you’ve been following along for some time, this might look familiar to you. Now that Agretti are back in season, I wanted to revisit this wildly delicious weed, to give you more insight into the nutritional profile and some tips on how to prepare it. What is Agretti or monk’s Beard? Agretti (Italian for "little sour ones"), also called barba di frate ("monk's beard") is a wild weed that grows in marshlands. It looks a lot like long thick green grass and as the Italian name suggests, it’s a bit tart when eaten raw. Once cooked however, it has a nice bite and quite a delicate flavour, reminiscent of spinach. Much like most leafy greens, Monk’s Beard or Agretti is a very delicate vegetable that should be consumed fresh, or refrigerated for no more than a few days. In Italy, it’s available at the farmer’s markets and many supermarkets and fruit and vegetable vendors during the spring months. If you can't find it where you are and you're into growing things, it seems that it can be done quite easily, check out this link for tips from Jamie Oliver's gardener. What are the nutritional benefits of monk’s beard? Agretti is from the same family as spinach and beets and is loaded with nutrients. It has a high water and dietary fiber content and is rich in vitamin A, calcium and phosphorous and an excellent source of chlorophyl. Agretti is a good source of vitamin C (most of which is destroyed in cooking however) B complex vitamins, iron, potassium and magnesium, much like spinach and other leafy greens. Iron makes this vegetable useful for iron deficiency anemia. Just make sure you add a few squeezes of lemon juice to the cooked agretti, as cooking destroys the vitamin C needed for maximum mineral absorption. Magnesium also works with calcium and phosphorous to support bone health, but also plays an important role in relieving PMS, migraines and anxiety. By no means is this an exhaustive count of the benefits offered by each of these nutrients, but it’s a good highlight. Also, please remember that no one nutrient is responsible for good health, they all work in unison to do their part, which is why dietary variety is key for general health and wellbeing. First things first, make sure yo clean it properly, discarding the roots and tough bottoms and washing it thoroughly to elimate dirt and bugs. Immerse the raw agretti or monk’s beard in ice cold water for a few minutes. This will help keep the vegetable crispy and will prevent oxidation, even after cooking. The easiest way to prepare agretti or monk’s beard is to steam it, boil it or blanche it. My preferred method is blanching. Bring a pot of water to boil, remove from heat and add the washed agretti, cover and let sit for a minute or two until slightly wilted. Strain and serve as a side dish with a squeeze of lemon juice, apple cider vinegar or umeboshi plum vinegar and/or a drizzle of olive oil. Chop into bite size pieces and sautéé it for a minute or two with extra virgin olive oil and shallots and add it to whisked eggs for a frittata or omelette. For a vegan alternative to eggs, add it to a batter of chickpea flour, salt and water, with herbs of choice for a chickpea frittata or pancake/fritter. Sautée for a minute or two in extra virgin olive oil, garlic and chili flakes for a tasty side dish. 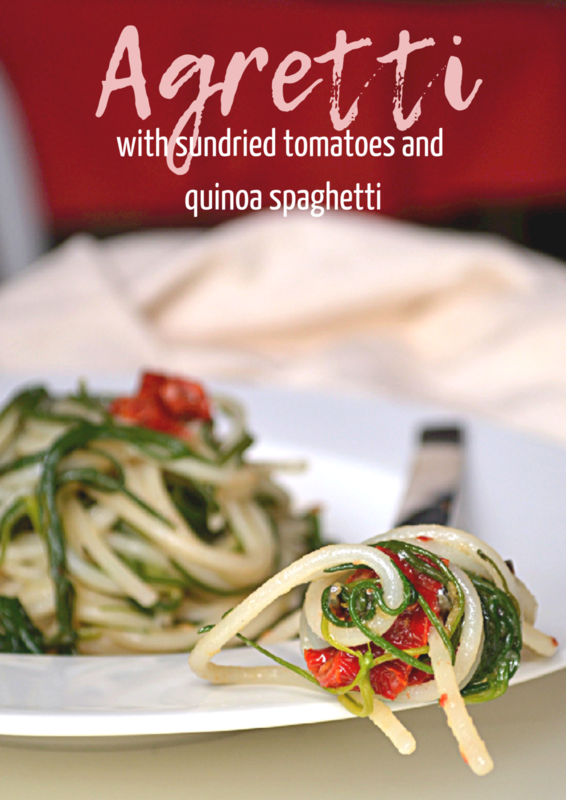 Take it a step further by adding sundried tomatoes and use it as a condiment for pasta (recipe below). Bring a large pot of water to boil, add coarse sea salt and cook pasta according to package directions for al dente. Bring another small pot of water to boil for the agretti. In the meantime, soak sundried tomatoes in hot water for about 10 minutes until softened, then chop into bite sized pieces. Clean the agretti by cutting off the roots (purple and white parts), and using only the bright green parts. Soak and rinse thoroughly to remove all traces of dirt then drop them in the boiling water for 1 minute, just to blanch them. Strain and rinse in cold water to stop the cooking process or place in an ice bath in you prefer. While pasta is cooking, sautee crushed garlic and sundried tomato pieces on low heat until garlic is slightly browned and fragrant, but not burnt. Add rinsed agretti and a couple of drops of the pasta cooking water and sautee slightly, about 2-3 minutes. You don’t want to overcook them and you want to be sure they maintain their vibrant green colour. Season with fresh ground black pepper and chili flakes to taste. Remove from heat and add lemon juice to taste, and a drizzle of extra virgin olive oil, toss some more and serve immediately. If you make this, snap a photo, share it on Instagram and hashtag it #holisticniss #nourishlivepamper so I can find you.